Democratic Rep. Jared Polis, a candidate for governor of Colorado, warned voters on Thursday that women will likely die at an increased rate if they elect his Republican opponent, Walker Stapleton. "If Walker Stapleton was elected, mortality for women would likely go up with these policies he’s advocating, the HIV infection rate would go up," Polis said. Polis made the remark at Planned Parenthood of the Rocky Mountains while speaking with employees and volunteers of the abortion provider, The Denver Post reports. One employee from Planned Parenthood Votes Colorado, the political arm of the organization, mentioned a study that showed mortality for mothers was high in Texas, saying it was becuase the state has a lack of access to clinics like Planned Parenthood. The study, in reality, found many factors for the higher mortality rate and that lack of access to Planned Parenthood clinics wasn't the cause, the Post reports. Stapleton’s campaign manager responded to Polis’ "revolting" comment. "As a husband and a father who reads to his two young girls every night before they go to sleep, it’s disgusting to see Jared Polis sink to such outlandish and false attacks in an attempt to scare women into voting for him," Michael Fortney said. "Jared Polis should be ashamed of himself and this revolting comment should be condemned by Coloradans across the political spectrum." Democrats have launched renewed attacks on Republicans in regards to women's and reproductive issues as the Senate prepares to start the confirmation process of President Donald Trump's Supreme Court nominee Brent Kavanaugh. Kavanaugh's confirmation could potentially shift the court's opinion when it comes to the issue of abortion. "Truly, we will lose the national backdrops of protections we have," Polis said in reference to the possibility of Kavanaugh being confirmed. "We would look forward to enshrining reproductive choice into law so that women can be assured that nine judges in Washington — five judges in Washington — aren’t taking away their rights." 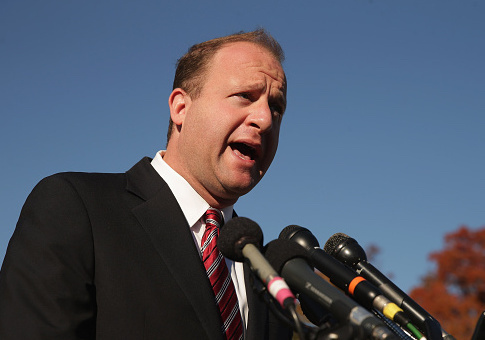 This entry was posted in Politics and tagged Abortion, Colorado, Jared Polis. Bookmark the permalink.